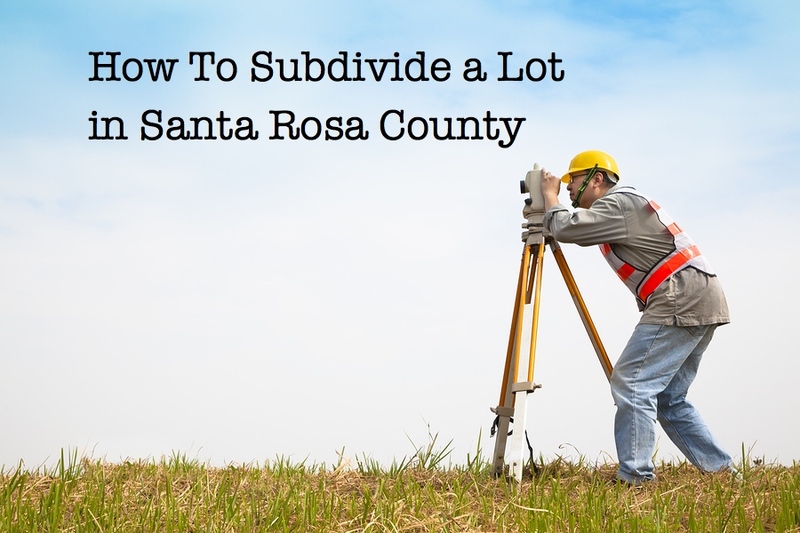 How To Subdivide a Lot in Santa Rosa County – ~EARN. INVEST. REPEAT. We learned a lot through this process: zoning, required set backs, required road frontage, required acreage, # of dwellings, etc. In a recent acquisition, we purchased a duplex that was on a half acre lot in Gulf Breeze (discussed in the post titled: Purchasing Our First Duplex ). The west side of the lot was overgrown and not in use except by the trees and weeds. Before we offered on the property, we thought about subdividing to either sell the lot, posting a BYOT (Bring Your Own Trailer) sign, or put a trailer on it ourself… untapped revenue potential and additional monthly cash flow awaits! Before we dive into the steps we took, we learned a lot through this process: zoning, required set backs, required road frontage, required acreage, # of dwellings, etc. In our particular area in Gulf Breeze, lot size is restricted to a minimum 1/4 acre with 70′ of road frontage and only one dwelling per lot (regardless of size). Having never done this before, here are the two steps we used to subdivide a lot in Gulf Breeze. Fortunately we didn’t have to do this. Come to find out, the owner we purchased this property from in Gulf Breeze had the same idea. Luckily for us, he had already performed the land survey and was willing to share his plans. If you don’t have a land surveyor, Google Magic is the way to go and I encourage you to shop around – prices do vary. The land surveyor should know the restrictions for lot size, road frontage, setback, etc. needed to meet county or zoning requirements. This requires a physical trip to one of their offices. I went to the one in Gulf Breeze and was in & out within approx. 15 minutes (maybe I hit it at the right time on the right day, but Michelle made it quick and easy). We had to submit the plans drawn up by our Pensacola surveyor and fill out a Parcel Combination/Separation Request form. Make sure the Property Appraiser rep gives you a copy of the Parcel Combination/Separation Request form. With this copy you’ll be able to start applying for building permits (otherwise you have to wait until your request is approved).